Home » FullTiming » Internet access solutions. I earn my living while fulltiming as a Linux, Server and network consultant. I also do development work for some clients. This means it is absolutely essential that I have internet access at all times in my motorhome with a fall back in case of any failures. Currently I have a range of gear consisting of. A 3G magnetic mount antenna. An Ethernet over Wireline router. Plus some other miscellaneous devices. Each of these devices has pros and cons and I am forever swapping them out depending on where I am and what I am doing. For instance for 3G, if I am on hookup and using my main computer I need to plug the 3G dongle in with the external antenna to get the best possible speed. However this means that my tablet and phone don’t get access to it. If I am on a campsite with wifi I use my iBoost from http://www.motorhomewifi.com which is excellent. But this kit uses a different network IP range to my other gear so I have to mess about a bit when I am on this. When I am at a friends place or a small CL that I am friendly with I will plug in my Ethernet over Wireline gear. To make this work with my iBoost I unplug the external directional antenna. The problem here is I then have 2 wifi systems running and there is occasional conflicts with the IP ranges. I have to power one down and back up to get a fresh DHCP lease on a good IP range. The final issue is that there is a problem with the powerline gear but only when used in combination with the iBoost router whereby the sparks used to ignite the boiler knock out the connection for 20 seconds a couple of times an hour. So to cut a long story short I have jumped in and decided to look for a single solution that covers all my needs. What I need first is a single router that will handle 3G connections, The Powerline system and a Ubiquiti NanoStation loco M2 directional Wifi antenna. That is a lot to ask from a router and I just couldn’t find a consumer unit to do this. So I started looking at the commercial and enterprise units and tripped over this. I bought mine from Amazon and it should arrive within the next 2-3 days. It is priced at around £50. Now this device looks great on paper. It is By MicroTik who are a high end router manufacturer. It has the following features all in one small package. PoE Power over Ethernet. Which means it can power my external Ubiquiti NanoStation Loco M2 directional antenna without a separate PoE injection box. USB Port with support for 3G/4G modems. Built in Dual mode Wifi Router 2.4GHz and 5GHz. 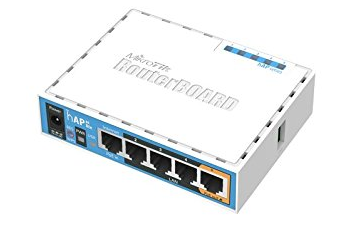 This is a heavy duty router with too many internal networking features to list and would probably be over the head of the vast majority of readers unless they have enterprise networking experience. However it is supposed to come with a simple set up wizard for the basic configuration that most people will need. Looking at the above picture. This unit will be securely mounted to my wall. 12V will be applied to the left hand port. The orange port has PoE out so my Loco M2 will plug in there. My main computer will plug into port one. Port 2 will be my Powerline Ethernet router. The USB port on the side will have an extension lead in it leading to my wall mounted 3G/4G USB modem stick. I will configure the software to prioritise the connection in this order. Ethernet over PowerLine, Loco M2 wifi, then finally 3G/4G modem. I will have a single wifi access point in the van instead of 3 and I won’t have to unplug or reconnect and reconfigure things before I can get on the internet. The current equipment with links. I currently have an iBoost system which I bought from http://www.motorhomewifi.com/catalog/iboost-wifi-system/ . This is an excellent kit which consists of a TP-Link router and a Ubiquiti NanoStation Loco M2. It comes preconfigured for motorhome use and is very good. Although I do have some minor gripes with it, it has served me extremely well over the last number of years I have been using it. This is the Ubiquiti Nanostation M2 and this is the suction cup mounting. I have also have the TP-Link TL-WPA4220T KIT V1.20 AV600 which is a 3 part kit. I went for overkill on purchasing this. It has one base unit which you plug in next to the main internet router and connect it via a short ethernet network cable. You then also have 2 additional slave parts. These both have 2 Ethernet sockets and a wifi system built in. You plug one of these into the mains in your van and you then have 2 wired connections to the internet AND a wifi access point for tablets/phones. Ethernet over Powerline is probably not much use to most motorhomers but it can be very useful for fulltimers who are more likely to develop friendly relationships with the owners of places you stop regularly. Once it arrives I will do a full review and show you how the system works and what I can do with it. If I can get it all working the total price just for the Wifi side will be £115 or there abouts. However it will have additional features of being a 3G/4G Mifi type router for the van as well. ← 3G/4G data sim only, the best value? Did you get this up and running yet? I’d be very interested in how you did it because like you I have a Huawei mifi router and I also fitted in a Loco M2 nanostation and a Ubiquiti Air Gateway it all works fine but it would be nice to integrate it all but I wouldn’t know where to start without some instructions to follow. I have a new 3G/4G router arriving in the next week and I will be working on integrating it all together in the next 2-3 weeks. So hopefully by the end of April there should be an article published.